The second book in the Void trilogy is The Temporal Void. Again, the novel is split into two separate sets of plot threads, one focused on events in the Commonwealth and the other focused on Edeard’s life on Querencia inside the Void. The Commonwealth-set part of the book begins with two violent events – one a trap set by the psychopathic Higher agent Cat to try to entrap rogue physicist Troblum and dogged investigator Paula Myo, the other a planetary invasion as the military force of the Living Dream movement launch a massive operation to try to track down the elusive Second Dreamer who has just become aware of their ability to communicate with beings inside the Void but continues to shun the Living Dream movement. A race then ensues as three factions – Living Dream, the technology-obsessed Highers and Paula Myo’s agents - all try to track down the Second Dreamer who only wants to keep their quiet life as it was. Meanwhile, another event with potentially much more devastating consequences is occurring as the Void goes through a massive expansion swallowing several surrounding star systems and destroying the Centurion observation station. As most flee the Centurion station, Justine Burnelli bravely takes her spaceship towards the Void on a seemingly suicidal mission, but with the assistance of the Second Dreamer she manages to pass through the Void’s outer barrier and discovers a world both like and unlike the utopia the Living Dream movement predicted. She then sets off to try to communicate with whatever intelligence might be controlling the Void to persuade it to halt the expansion that could potentially destroy the rest of the galaxy. Elsewhere in the galaxy Aaron has completed the first part of his mission and captured the Living Dream founder Inigo who was hiding in self-imposed exile. Now he has an additional challenge as he is forced to escape a dying planet while keeping the recalcitrant Inigo from escaping. At the same time Kazimir, the admiral of the Commonwealth Navy readies his forces to defend against an invasion fleet by the seemingly outmatched aliens of the Ocisen Empire, who believe that the Living Dream’s proposed pilgrimage must be stopped at all costs. The Commonwealth Navy finds that the Ocisens have some unexpected and powerful allies, but the Navy itself has a few secrets up its sleeve. The Querencia-set part of the story opens with Edeard the toast of Makkathran society after his heroic arrest of a leading gang member – the strong psychic powers he displayed during the arrest having made him an instant celebrity. Despite the distractions of several young noblewoman fascinated by the novelty of a young constable from an obscure rural province who has greater psychic powers than the strongest of Makkathran’s nobility Edeard is determined to stick to his aims of breaking the hold the criminal gangs have on Makkathran life. Backed up by his fellow constables he sets out to defeat the gangs by using a mix of strength and guile combining intensive policing with astute use of some obscure legal measures. However, the gangs are ruthless and not above targeting innocent friends and family members of the constables chasing after them and Edeard comes into increasing resistance as he starts to realise there are many connections between the gangs and Makkathran’s aristocracy who have dominated the city for generations. Along the way he gets embroiled in a political struggle between those who feel breaking the gangs is the most important priority and those who think that Makkathran’s leaders should look at the bigger picture and act against the increasing bloody bandit raids that are devastating the outer provinces (and had previously destroyed Edeard’s home village) by establishing a stronger state where Makkathran would take overall control of the entire continent. Unlike in the previous novel where Edeard’s story was much more interesting than the goings-on in the Commonwealth this time round there is a better balance between the two storylines. The Commonwealth plot is much better paced this time, freed from the necessity of having to spend hundreds of pages introducing the complex array of characters and plot lines there is a much better mix of action throughout the book rather than most of it being concentrated at the end of the novel. There is still a small criticism to be made here, in that even though this is a very long book the Commonwealth storyline does not advance many of the plot threads very much – the storylines surrounding Paula Myo, the Second Dreamer or Aaron and Inigo make some progress but Edeard’s storyline still has a lot more plot advancement (perhaps a benefit of focusing on a single character rather than a dozen or so characters spread out across a galaxy). Edeard’s story continues to be very entertaining with some interesting and complex plotting, some satisfying action scenes and some intriguing hints that while Inigo is dreaming Edeard’s story some information may be going the other way as Edeard comes up with a few rather anachronistic ideas. The fight against the gangs also has a few topical elements, Edeard’s inventive use of the law to fight the gangs is presumably meant in part to be a commentary on modern attempts to fight terrorism and organised crime. The issues raised by this element of the story are thought-provoking, since we see things from Edeard’s viewpoint we are naturally sympathetic to what he is doing, but a lot of readers would probably be opposed if some of the measures he uses were used in real life and bring to mind the age-old question of whether the ends justify the means. There are occasional problems with Edeard’s plotline, for someone who can be effective and ruthless when fighting the gangs he can be irritatingly naïve at times (perhaps understandable as he is still a young man with very little life experience). A more serious problem is that Edeard’s psychic powers are so strong that at times is seems implausible that he is in any real danger as he starts to turn into Makkathran’s version of a cross between Batman and Jesus. However, Hamilton saves the best until last in that storyline, the penultimate Edeard chapter in the book is possibly the best chapter he’s ever written with some hard-hitting and shocking events and a series of surprising plot twists that both indicate the true power and ruthlessness of the gangs and their allies and also finally explain the previously-mysterious question of why the Living Dream movement is so entranced by Inigo’s dreams of Querencia. It is an excellent conclusion to the second volume of the trilogy and suggests that the concluding volume could be an equally fascinating read. 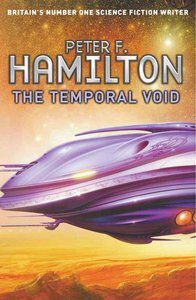 In summary, after a somewhat mixed first volume, the second book in the Void Trilogy is one of Hamilton’s best novels covering a huge variety of plotlines and settings. The Commonwealth-set part of the series is still not quite Hamilton’s best space opera work but it is still intriguing and entertaining with some audacious plotting and despite occasional flaws Edeard’s storyline is highly entertaining with a stunning conclusion. Thanks for the review. It makes me want to read Book 2 now. I too felt the first book was alright, but, not the typical gripping stories that Hamilton writes. I was just like, not bad.. So, I have been hestitant about reading book 2.